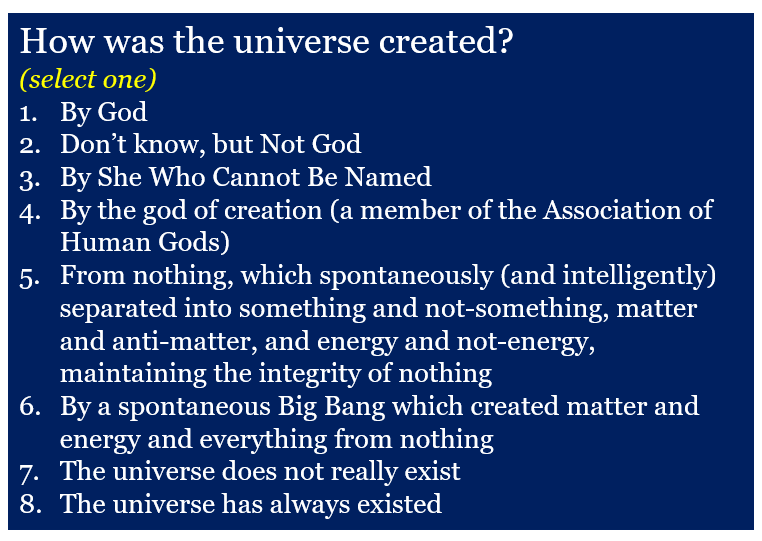 Religions have no answer to the question and merely invoke God (or a god among a a pantheon of appropriate gods). Science has no answer either. No physicist or astrophysicist or cosmologist actually has the faintest idea about where energy and matter came from. The disingenuous claim that a smooth nothing suddenly and spontaneously produced clumps of matter and anti-matter (such that the total remained nothing) is just as far-fetched as any creation myth. Energy is handled similarly. The otherwise homogeneous universe is allowed to have clumps of “something” provided that they can be neutralised by equivalent amounts of “negative somethings”. The Big Bang is just a label for a Big Unknown. Atheists, of course, don’t even try to answer the question. They are satisfied to say that the answer is unknown but they do know that it is not any kind of conception of God. Religions again have no answer and invoke God or gods. Science has no answer either and puts it down to random chemistry which became biochemistry and which, by accident, led to life. Neither science nor religions nor philosophy have the faintest idea of what time is. This entry was posted on December 7, 2018 at 2:24 pm and is filed under Philosophy, Religion, Science. You can follow any responses to this entry through the RSS 2.0 feed. Both comments and pings are currently closed. Creation of everything from nothing is just mind boggling for humans. We must learn to live with this situation!! !